Anakbayan–USA joins the Filipino people all over the world in commemorating one year since super Typhoon Haiyan made landfall in the Philippines, resulting in the death and the displacement of millions of people. We remember those who not only perished during the storm, but also those who have died due to the criminal neglect of the Aquino administration and their incompetent response to this calamity. On November 8 of last year, Typhoon Haiyan, known in the Philippines as Yolanda, made landfall in Eastern Visayas. Typhoon Haiyan delivered sustained winds of 195 miles and storm surges as high as 17 feet. According to the United Nations, it has affected more than 11.5 million families, roughly 10% of the country’s population. As many as 18,000 are believed to have died from the direct devastation of the typhoon, three times larger than the official government count. The total economic loss as a result of the disaster ranges between $6.5 billion to $15 billion. This disaster was made worse by the Aquino government’s incompetence. Aquino’s government was caught wilfully unprepared, despite numerous warnings by the Philippine Atmospheric Geophysical and Astronomical Services Administration (PAGASA). After the typhoon made landfall, the government took almost two weeks to send teams to assess the damage and give immediate relief. As relief aid poured in from around the world, Aquino and his government continued to botch the relief and rehabilitation of the affected areas. The Philippine government’s own Commission on Audit (CoA) special report on the typhoon Haiyan relief operations reported 128,000 cans of sardines, P69.2 million worth of bottled water, P58 million worth of supplies were wasted due to irresponsible storage. This includes some 7,527 family food packs valued at P2.7 million. This is on top of truckloads of rotten goods that were buried underground by the Department of Social Welfare and Development (DSWD). Most of these were left rotting inside government warehouses without ever being delivered to those who needed them. A total of P700 million of monetary donations sent for immediate response to help the typhoon victims are still languishing in government banks. Worst, Aquino has transformed the rebuilding of Eastern Visayas into a profit making opportunity for big businesses. 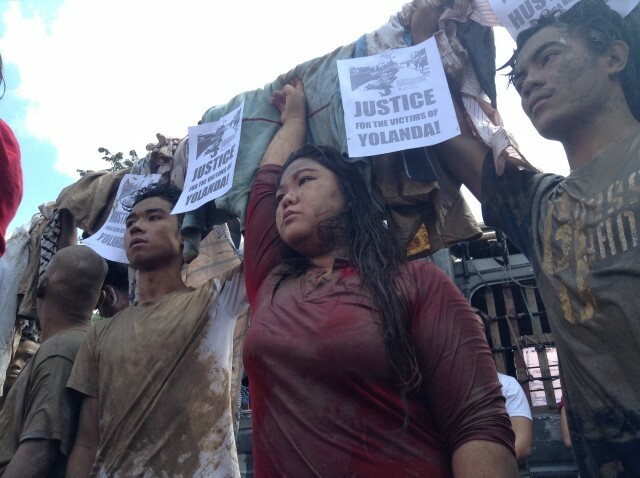 To name a few, Ayala Land, Ayala Foundation and Nickel Asia Philippines, both notorious for land grabbing and human rights violations are major partners of Aquino’s rebuilding plan. As we see it, this is a clear land grab scheme and profiteering from the calamity. We also cannot simply agree that typhoon Haiyan is just a natural disaster. Haiyan is a product of the dominant global economic system of Monopoly Capitalism (Imperialism), an economic system hell-bent on plundering the world’s resources at the cost of the planet’s ecological sustainability, in the name of maximum profit for corporations. Powerful countries, such as the United States, are the main culprit in the destruction of the world’s environment and ecosystem. The G8, a group of 8 wealthiest countries, holds 57% of total global carbon emissions, with the United States leading with 26%. These countries also bear historical responsibility since they owe their current wealth and power from the exploited and plundered resources of poor countries such as the Philippines. Plunder and exploitation by the United States, in conjunction with BS Aquino’s corrupt government, left the Philippines and the people Eastern Visayas even more vulnerable to climate change and devastation brought by super typhoon Haiyan. We in Anakbayan–USA stand with the survivors as they struggle to seek justice and rebuild their communities. We support the continued effort to bring genuine relief to our people in need. We support the efforts of typhoon survivors to build grassroots power by organizing themselves and waging a struggle for their basic rights. It is only through their organizing that they can claim justice. We support the call to hold the Aquino government accountable for its criminal negligence. We join the growing chorus calling for the ouster of BS Aquino as an incompetent president who is more interested in a publicity stunt than actually helping our typhoon devastated kababayans. We encourage every Filipino, both here in the US and back home in the Philippines, to join and support the cause of National Democracy. National Democracy is putting the interests of the Filipino people, particularly the poor and working people, over the profit and interest of big businesses. We assert that only by implementing genuine agrarian reform and national industrialization can we rebuild a more sustainable Philippines.